Last week a mystery bird from New Jersey rightly caused a fair bit of confusion among birders of the Garden State and beyond. The bird was a sparrow, that much was clear, but it didn’t seem to fit any of the easily boxes the other North American sparrows can be fairly easily sorted into. Superficially, it resembled the Black-chinned Sparrow of the southwestern United States with its gray chest and chestnut streaked with black back. A bird like that would be a remarkable record for New Jersey, well, for anywhere in the eastern half of the continent for that matter, as the Black-chinned Sparrow does not have an established pattern of vagrancy outside of the Great Basin. But a lot of things didn’t quite add up for thet potential first state record. For starters, the bird was structurally wrong, with a much larger beak and a flatter head than than any Spizella. Plus those streaks on the head were a problem, as is the whitish belly. There’s a little hint of white in the malar and throat too, which would seem to be a problem for the species Black-chinned Sparrow. It’s clear that this bird was something different, but how does one go about trying to identify a bird that’s not in the field guides? Field identification of abnormal birds is fraught with peril. In my experience, I’ve noted how birders, particularly newer birders, can have a tendency to jump to conclusions when they see any sort of bird that doesn’t match up perfectly with the picture in the field guide. We’ve been well trained, if inadvertently, by our Sibleys and Petersons to look for that type specimen every time, but within a given species there’s as much variation between individuals as there is between individual people. Granted, it’s not always on a scale we can readily appreciate, and we humans are much more attuned to the differences in each other because that’s how we recognize friends, family, and celebrities on the street, but when a bird is even slightly different from the norm, it’s generally the more expected species than the unexpected. As the old saying goes, “when you hear hoofbeats, think horses, not zebras”. This is not an easy bird, but it is expected. In it we can see things we recognize in other, more common, birds. Structurally, that long and low body, the pot-belly and the flat head. That slate-gray breast turning to white belly, the faint hint of a white-throat. Identification of abnormal birds such as this one is not an exact science, but this one seems to break down as one half White-throated Sparrow and one half Dark-eyed Junco. A hybrid. The bird was immediately apparent to be as such largely because a similar bird has been visiting a feeder, and well-photographed, in Henderson County in western North Carolina for the last three winters. 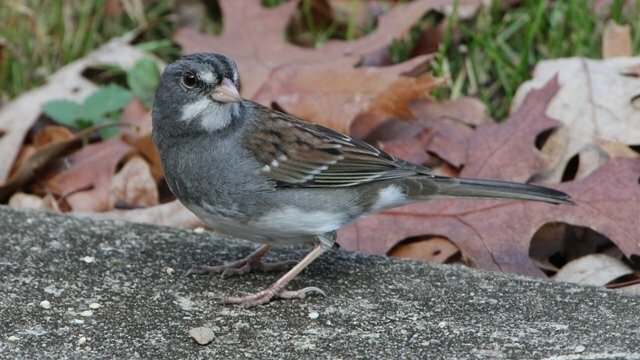 This NC bird shows a lot of the traits evident in the New Jersey individual but it illustrates the variety of ways White-throated Sparrow and Dark-eyed Junco genes can intertwine. The NC bird has a much more prominent white throat, as well as some white in the lores and in the undertail coverts. One could conceivably introduce the possibility of a back-cross (the parents of the bird in question being a hybrid and a full Junco), but at that point you’re walking down a dangerous and speculative path. Connecticut birder Mark Szantyr, in a post to Birdfellow a few years ago, photographed some birds that seem to shows some evidence of being intergrades (as well as a much more “White-throat-y” hybrid). Once you know that hybridization between these two species is, as the great ornithologist Charles Townsend relates, “extensive”, the possibilities are endless. White-throated Sparrows and Dark-eyed Juncos are both exceedingly common winter residents across a great swath of the continent and their breeding ranges, in great part, lie right on top of each other, so it’s sort of remarkable we don’t run into these hybrids at feeding stations more often. David Sibley, in his seminal field guide, even illustrates this combination along with the Zonotrichias, though his illustration shows far more White-throated Sparrow traits than the New Jersey or the North Carolina bird. It should be enough to send birders to their feeding stations and hedgerows to look for these unusual birds, because they’re out there. And once you feel comfortable tackling winter sparrow intergrades, well, then I can introduce you to the really weird stuff. Ladies and gentlemen, I give you the “Durham Mystery Sparrow”. 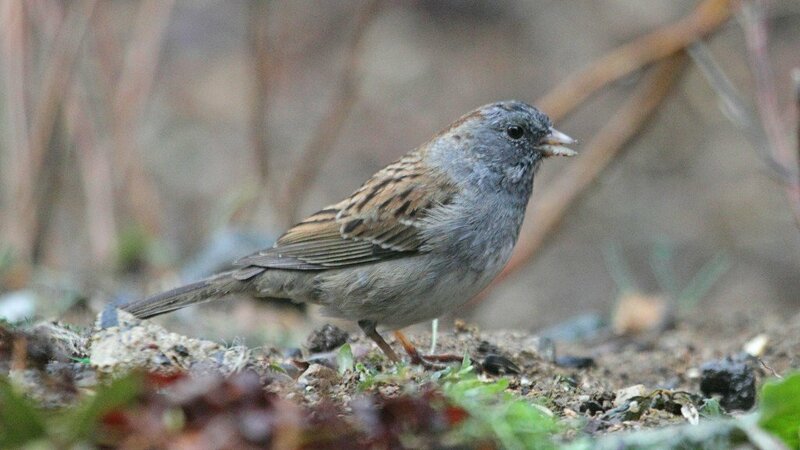 When I first looked at the 1st photo I thought Dunnock or Hedge Sparrow? did you look at things like Black-Faced Bunting (Emberiza spodocephala)? Looking that these birds (and the Durham bird) have caused multiple blood vessels in my brain to burst. A hybrid combo I’ve not even thought of…you win again birds, you win again. We had a bird like this in Calgary around 20 years ago. Really had us going for a while till I got some pictures(film) and some experts got a look at them and solved the mystery. I didn’t get any of the pictures back! Fascinating! I’m surprised at the variation among the Dark-eyed Juncos at my feeder. Would love to see this! Very interesting, and great photos. I thought you and your readers might also be interested in a possible Song Sparrow x Dark-eyed Junco I photographed in Utah last year. A wonderful mystery bird, gets us out of the book! I have a Red Head Duck in my yard and bay for over a week now, hanging with a flock of Mallards and he is very interested in one of the Mallard hens to the point of sleeping next to her. The male Mallards don’t seem to mind his presence. I wonder if he flew up here to No. Mn on the border with Can. together. Makes me wonder about possible cross breeding. On the other hand as keeper of 21small species of birds in aviaries, I see lone birds like our male Rosey Bourke, very interested in a female Linneolated. The Linnie has a mate, along with another pair of Linnies, yet she constantly is found in the company of the Bourke. And when I let them out of the cage for some flight time, they stick together too. In or out, they sit together, talk, act like they are sharing food, etc. Nature is very interesting folks, and birds know they are happiest in a flock, no matter if it is their own kind or not! Where Are You Birding This First Weekend of March 2012?